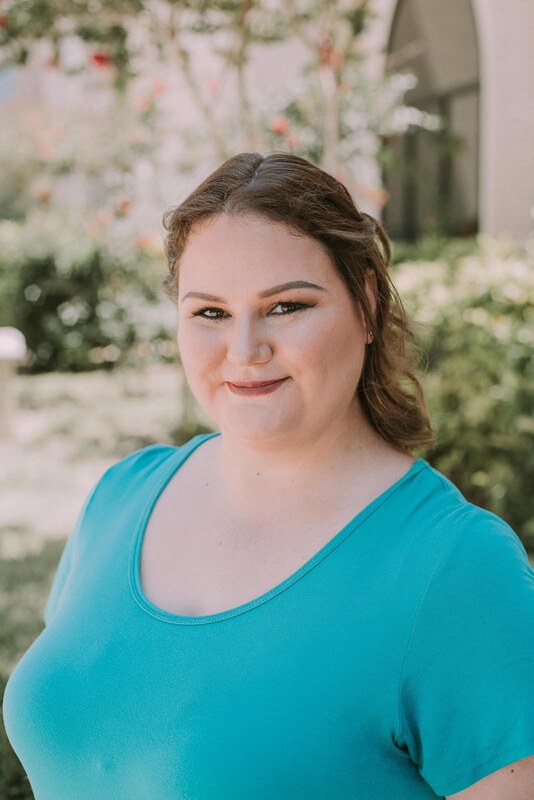 As per request from Nicole [Twitter page] from Magic Maid [website], I have a comparison post for you. Sadly, this morning as I was driving to my parents' cabin, I broke my nail so I am back to nubbins for another month until they grow back out. 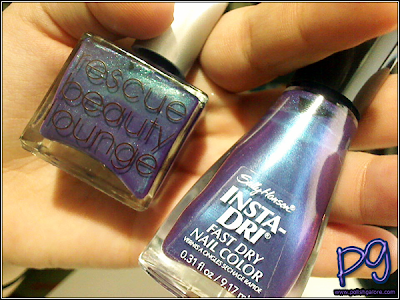 The colors being swatched are Rescue Beauty Lounge [official website] Scrangie and Sally Hansen [official website] Grape Going!. Scrangie is one of the "Blog Writer's Colors" that came out late this summer. 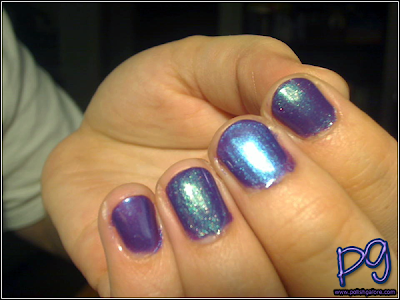 Explained by Scrangie herself, this is a "medium blue-based purple with green iridescence and green microshimmer." (By the way, check out her Twitter and her blog. You'll thank me later.) It is gorgeous on the nail, and when I wore it as a pedicure, it lasted 3 whole weeks without chipping. This was also my first RBL polish and is a more expensive polish for only 0.4 ounces. With shipping, I paid $26.50 for this ONE polish ($18 for the polish, $8.50 for ground shipping - the only shipping available). 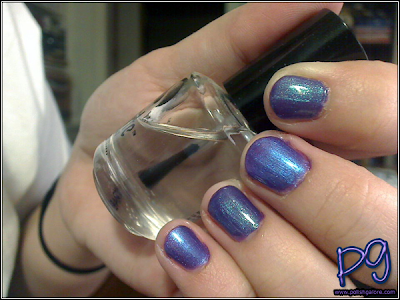 So imagine the delight to bloggers when Sally Hansen came out with Grape Going! (Yes, the exclamation point is apart of the polish color.) It's a duochrome of blue and purple, and only when you have the bottles next to each other in person, can you tell that Grape Going! 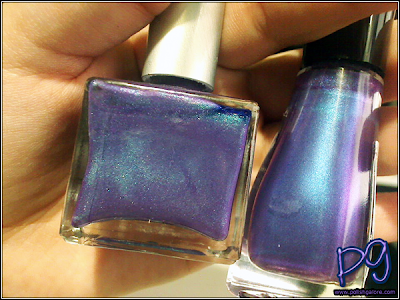 has a strong blue shimmer while Scrangie has a strong green shimmer. In photos however, well. I painted my pointer and ring fingers with Scrangie and my middle and pinkie fingers with Grape Going! You can also see a bit that Scrangie has a bit darker purple base. This is 3 coats of polish each, with a layer of Seche Vite base coat, but no top coat as to not alter the polish. You can really see the green vs blue shimmer here and again, in person, there's no question that I'm wearing two different polishes because of the shimmer. So there you have it! Grape Going! is close but not a real dupe. Imitation is the sincerest form of flattery, right? Great comparison, I might pick up the SH! Both polishes are defiantly similar! There both gorgeous colours though. I went out in the sun today and both colors look very much alike! It's really only in the SHADE that you can see the blue shimmer vs green shimmer. wow, they are very similar!! so excited asbout your new light box :) I really want to get one! Nice comparison! I think I might actually like the SH a bit better! Good comp! I never would have guessed there would be another color so close to Scrangie!